The Springhill Suites Old Montreal is found in the downtown area of Montreal, Quebec. It’s just behind the popular business district and nearby all of the popular sporting and cultural events in town. Local attractions that can be found near the this Montreal hotel include Chinatown, the Olympic Stadium and Place Des Arts. 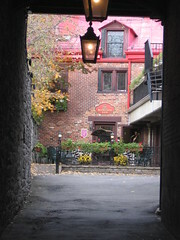 The Springhill Suites Old Montreal is located within a walking distance from Old Montreal. It can be found at Rene-Levesque Boulevard West and is adjacent to the well known Montreal Convention Center, making it a convenient hotel for business travelers. Guests at the Springhill Suites Old Montreal are treated to cable TV, air conditioning, full kitchenettes and irons. There are 148 individual rooms on 17 floors all with desks, tables and chairs and decorations of print fabric and granite lamps. The on site Yu Hang restaurant serves Chinese cuisine while the Cafe Bistro serves snacks and has a grocery counter. Hotels in Montreal are usually luxurious and modern and the Springhill Suites Old Montreal does boast some impressive visuals. This hotel targets vacationers and businesspersons, evidenced by its many on site amenities. 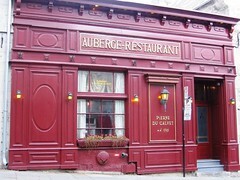 This all-suite hotel is discreet and classy, tucked away on a quiet side street of Old Montréal. Our suite's convenient floorplan offered plenty of space, plus all the basic amenities that we were looking for in a city hotel. This hotel answered our needs beautifully. You couldn’t wish for a more perfect address, right smack in the center of Old Montréal, two short blocks from the river and within walking distance of the fantastic science museum and the Quays of the Old Port. It is the most beautiful area of this gorgeous city, and this hotel puts you in the middle of it. We stayed in a deluxe suite, which was slightly larger than the standard suite. The room featured a bedroom with a king-size bed, flatscreen TV and MP3/iPod charging dock. A separate living area contained a pullout sofa, flatscreen TV, desk, and a wet bar with a mini refrigerator and microwave. Cable TV carries both French and English stations, and there is also free in-room wi-fi. This hotel offers a small fitness center and a small indoor pool with a hot tub, and there is also an on-site spa. The pool is not large enough to swim laps; it's really more of a relaxation pool. Joggers can take advantage of the pedestrian riverside promenade, which stretches along the Old Port for several miles. Ask for a room on a top floor to minimize the street sounds at night. There is a small grocery/snack store on the corner of rue Saint-Jean-Baptiste and rue Saint-Paul, less than a block from the hotel. We shopped here to stock our fridge with beverages and snacks.